VIT MICKA: Reminiscing of DON JOSE for SOLO VIOLIN. MICKA VIT: Introduction and Toccata "Bear and weasel"
This COMPOSITION with quasi jocose title was originally composed for two PIANOS and eight hands. Author dedicated this piece to a dutch PIANIST, who as teacher worked a lot with her pupils on four and more hands compositions. Although the premiere of the demanding original version was successful, it gave a thought of not many chances to be often performed. 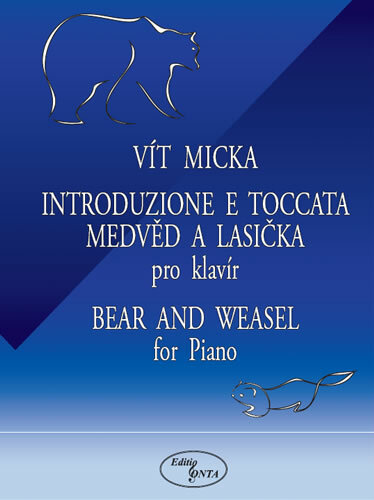 Therefore VIT MICKA rewrote Bear and weasel also for the SOLO PIANO and this version was fantastically premiered IN PRAGUE by PIANIST JITKA CECHOVA. Before the USA PREMIERE ( Tanglewood 2005 ) MICKA once more revised it with aim of enlargement, more virtuosity and to make it free from some features of didactics. Purchase in person and pay in cash at: Na Výtoni 10, Praha 2, 128 00, Czech Republic. Please agree arrangements by first telephoning +420 608982995.